In stock -This product will ship today if ordered within the next 10 hours and 10 minutes. This distinctive nutty flavour and aroma of toasted sesame oil adds an Oriental appeal to stir-fries and sautes, dips, dressings, marinades and vinaigrette`s. Produced in Japan from carefully toasted sesame seeds gently pressed to expel their delicate, fragrant oil. Use it in stir-fries and sautéed dishes as well as in marinades, vinaigrette`s, sauces, and oriental noodle salads or fried noodles dishes. It goes particularly well with Clearspring Organic Kagisa Shoyu Soya sauce and ginger or garlic. 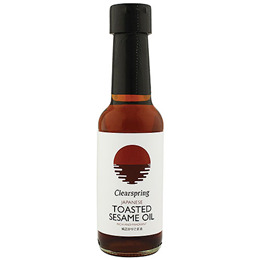 Below are reviews of Clearspring Japanese Toasted Sesame Oil - 150ml by bodykind customers. If you have tried this product we'd love to hear what you think so please leave a review. This distinctive nutty flavour and aroma of toasted sesame oil adds an Oriental appeal to stir-fries and sautes, dips, dressings, marinades and vinaigrette`s.